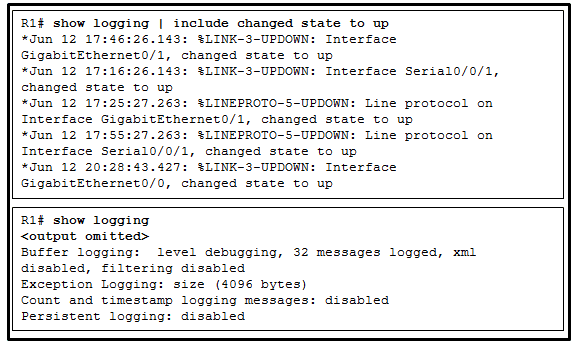 The “syslog” protocol uses UDP port 514 and is the most common method to access system messages provided by networking devices. 24 When SNMPv1 or SNMPv2 is being used, which feature provides secure access to MIB objects? 27. Which protocol or service can be configured to send unsolicited messages to alert the network administrator about a network event such as an extremely high CPU utilization on a router? 28. Which protocol or service allows network administrators to receive system messages that are provided by network devices? 29. The command ntp server 10.1.1.1 is issued on a router. What impact does this command have? 30. Which syslog message type is accessible only to an administrator and only via the Cisco CLI? 31. Which protocol is used by network administrators to track and gather statistics on TCP/IP packets that are entering or exiting network devices?